The population of Griffon vultures (Gyps fulvus) in Cyprus is decreasing from year to year. In some traditional nesting sites no more birds are seen. The black vulture Aegypius monachus is no longer breeds in Cyprus. This decrease was also observed in other European countries (Glutz et al. 1971). Until recently, very little was done to save the vultures in Cyprus. In this note we review the status of Griffon vulture in Cyprus, and we present the work of the Game and Fauna Service to assist these birds in their fight for survival. The Status of Vultures in Cyprus. In 1553, Locke (in Cobham) described an individual vulture and stated that "there are many in this island". Mariti, who was present on the island in 1760-67, noted that "one sees many vultures standing in the fields like flocks of sheep". Lilford found considerable numbers on Akrotiri cliffs, April or May 1875, and he believed that some were breeding, while many were also found in Cyprus by Guilemard (1888) in March 1887. Bucknill (1910) stated that the Griffon Vulture is a "tolerably common resident, although I do not remember seeing more than about twenty together". Bannerman and Bannerman (1958) noted that "it is a numerous species in Cyprus where as many as fifty have been seen near Polis at the carcass of a dead donkey, within the last few years. There are several breeding colonies in Cyprus, both in the hills and in high cliffs near the sea". Since 1956 nests have been found in the Kyrenia range at or near Lapithos, St. Hilarion, Buffavento, Akanthou, Pentadaktylos and Kantara; in the Troodos range near Kannaviou, in the Kouris valley and within the Paphos Forest; on sea cliffs at Episkopi, Cape Arnaouti and Cape Aspro, and also near Polis tis Chrisokhous (Flint and Stewart 1983). Nests also occur near Amargeti village and the cliffs of Ayios Ioannis in Paphos, where several pairs breed (Pers. observ.). In the early sixties vultures were still numerous in Cyprus and flocks of twenty or more could be seen feeding on dead animals in the Mesaoria plain. In the late eighties and early nineties vultures became a rare phenomenon in the sky of Cyprus. Several breeding colonies had possibly been exterminated. At Kremmos tou Pakhniouti near Kannaniou village the nesting site is not used any more because of the disturbance caused by a quarry facing the nesting site (Pers. observ. 1983). The vultures nesting at Avakas in the Akamas Peninsula were shot by poachers (E. Theodorou, Pers. commun.). On February 10, 1988, four dead birds were found at Stavros tis Psokas which were poisoned (Charalambides et al. 1990). During the past two years the vultures have been leaving the area of Karkavas and Mavri Kremi, inside the Paphos Forest probably because of disturbances from poachers (V. Pantelas, Pers. commun). Near Polis and Kyrenia range they were exterminated, while all the birds in the Kyrenia range are believed to have been shot and the population is slowly declining all over Cyprus (P. Neophytou, Pers. commun.). Improved pastoral hygiene (Polydorou 1986), probably contributed to reducing food supplies for vultures in Cyprus. However, the recent outbreak of echinococcus on the island and the new campaign for improved pastoral hygiene i.e. the destruction of all dead animals, is expected to further reduce the vulture population in Cyprus, which is estimated at about two scores. This decline has been observed not only in Cyprus, but all over Europe and North Africa. Presently vultures are extinct in West Germany, Poland, mainland Italy, Sicily, Romania, Moldavia, Ukraine, and the Southern Urals, with a continuing decrease throughout its range. This marked decrease in numbers is mainly due to decreased food supplies (caused by improved pastoral hygiene) and poisoned baits, though Glutz et al. (1971) suggested that earlier decline in central Europe was perhaps partly due to climatic deterioration. The Game and Fauna Service of Cyprus, in an attempt to compensate for the possible shortage of available carcasses, with the cooperation of the Forestry Department and Veterinary Department was providing dead animals for the vultures. In the summer of 1990 until March 1991, carcasses were transferred at monthly intervals near the cliffs of Ayios Ioannis and Inia village of Paphos. This program continued in the spring of 1993 transferring carcasses to the cliffs of Ayios Ioannis, with the participation of the Department of Forestry. The feeding area was fenced by the Game and Fauna Service to exclude mammalian scavengers. Game wardens and foresters transfer food at weekly intervals or when it is necessary. A number of juvenile vultures unable to fly were found by people in the wild, and brought to the Game and Fauna Service for care. These vultures were given medical care, were fed for a few months and released near the cliffs of Ayios Ioannis. One such bird was given to the Service in the Spring of 1991 and was released three months later. No birds were found in 1992. In 1993 four juveniles were brought, unable to fly. One of these was collected by V. Pantelas and S. Iezekil from the Forestry Department near the nesting area of Ayios Ioannis. The second was collected by fishermen on the shore of Episkopi village near Limassol; the third by Game wardens near Kannavia at Nicosia and the fourth was found by farmers near Tremithousa at Paphos. A fifth one was located dead by Dr. Paul Kroft near Roudias bridge at Paphos. The same year a juvenile was found drowned in the sea by the cliffs of Episcopi at Limassol. In 1994 a juvenile was collected near the nesting site of Ayios Ioannis by foresters, and another one was given to the Forestry Department by the British military bases in Cyprus. A third one was shot by hunters in December 1994, near Ayia Anna village. This bird was salvaged by Mr. S. Papakonstantinou and now is recovering under the care of the Game and Fauna Service and the Department of Veterinary Services. The Department of Agriculture provided the facilities to keep this bird until it fully recovered. 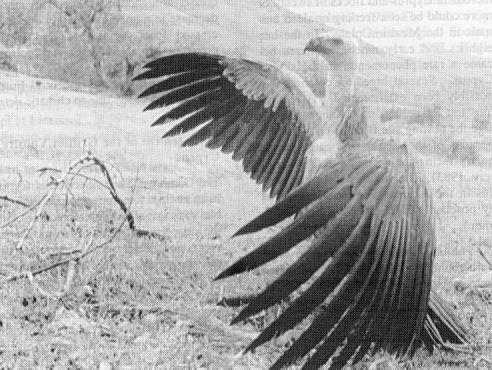 Before 1990 when a vulture was found, it was usually given to the Limassol Zoo for display. As a result in 1992 there were five vultures on display, although at present there are only three. In 1993 two eggs were laid in captivity at the zoo but they failed to hatch. No eggs were laid in 1994 and 1995. The Game and Fauna Service with the cooperation of other Government Departments is planning to commence a long range program to collect basic population data for the conservation of the vulture. Bannerman, D.A. and W.M. Bannennan. 1958. Birds of Cyprus. Oliver and Boyd: Edinburgh & London 384 pp. Bucknill, J.A. 1910. On the Ornithology of Cyprus-Part II. IV: 1-47. Cobham, C.D. 1980. Excerpta Cypria. Cambridge University Press. Charalambides C., M. Charalambides and P. Neophytou. 1990. The birds of Cyprus, the Cyprus Ornithological Society, Nineteenth Bird Report, 1988. Kailas Press, Nicosia. Glutz von Blotzheim, U.N., K.M. Bauer and E. Beazel, E. 1971. Handbuch der Vogel Mitteleuropas 4; (973) 5. Lilford, Lord. 1889. A list of the Birds of Cyprus. Ibis 1889: 305-3050. Guiillemard, F.H.H. 1888. Ornithological notes of a tour in Cyprus in 1887. Ibis 1888:94-124. Flint P.R and P.F. Stewart. 1983. The Birds of Cyprus B.O.U. Check list No. 6. British Ornithologists' Union. 174 pp. Polydorou K. 1986. Summary activities and results of anti-echinococcosis cam- paign in Cyprus (1971-1985). Ministry of Agriculture and Natural Resources, Department of Veterinary Services, Nicosia.